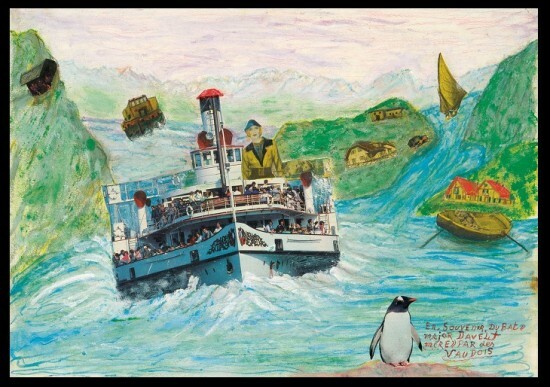 The Collection de l’Art Brut in Lausanne, the first museum dedicated to outsider art, launches a Biennale on themes that reoccur in the obsessions of their reclusive artists. It inaugurates the cycle with Vehicles to display 200 objects from its own collection of 63,000 pieces, a display that is pertinent, powerful and playful. 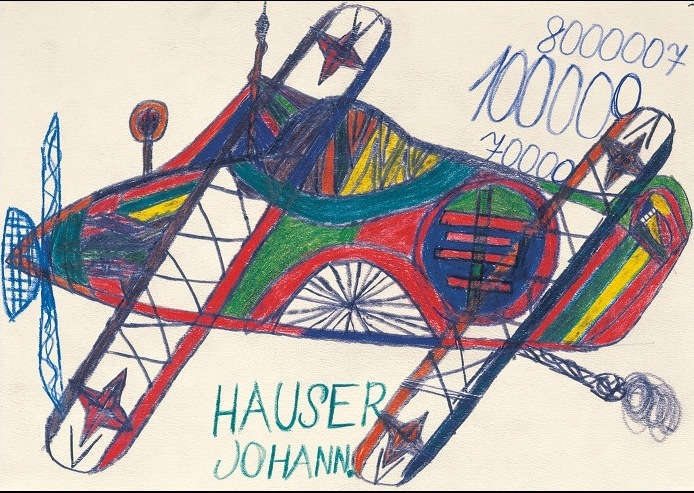 Johann Hauser (1926-1996): no title, from between 1958 and 1978, wax crayons on paper. Photo : Olivier Laffely, Atelier de numérisation – Ville de Lausanne, Collection de l’Art Brut, Lausanne Hauser never learned to read or write, inventing his own graphic system taking inspiration from newspaper cuttings of film stars, vehicles and war machines. Jean Dubuffet, who coined the term “art brut”, laid the foundations of what was to become the renowned Collection de l’Art Brut thanks to the donation of his own collection of 5’000 works. The Collection now confronts a growing appetite of the art market for the creative output of individuals who never meant to become part of the art world. Out of deference to these individuals, whose status as artists is almost accidental, the Collection refers to them as authors. The show Vehicles presents a delightful variety of paintings, drawings, contraptions and sculptures relating to all objects (trains, cars, aeroplanes, tractors, boats, buses. bicycles) that allows locomotion by air, water or land. Francis Mayor (1904-1995): In memory of ‘Major Davel’, from around 1990, painting and collage on paper. Photo : Olivier Laffely, Atelier de numérisation – Ville de Lausanne, Collection de l’Art Brut, Lausanne Born in Lausanne to a single mother who tried to rid herself of him, Mayor lived his adult life first at sea and then working on Lake Geneva. The main themes of the collages that he made when he moved to an old person’s home were the sea, boats and religion. Coming from individuals who were trapped in their inner minds and rarely moved themselves, the theme is pertinent, powerful and playful. It also allows for a very attractive and entertaining display. 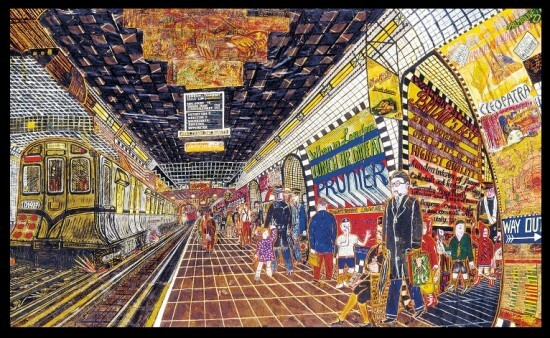 Willem Van Genk (1927-2005): Tube Station, 1970, collage and painting on wood Born in the Netherlands, Van Genk was a misfit who had travelled extensively before ending up in a workshop for the mentally challenged and beginning to produce complex cut-outs and collages.